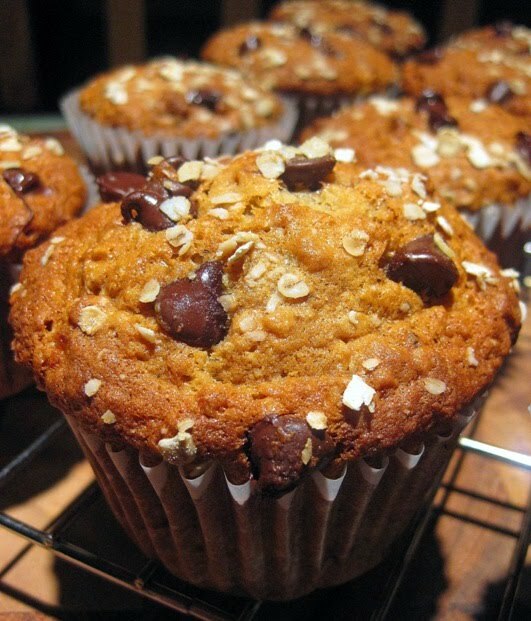 Healthy and delicious, these muffins will please everyone. I find a little chocolate always makes eating healthy easier. What? Don't look at me like that. I consider chocolate a food group. :) Enjoy! 2. Combine flour, oats, baking powder, baking soda and salt. 3. In a large bowl, beat the eggs & sugars lightly. Add the milk, butter, vanilla and the mashed banana. Combine thoroughly but don't over mix. 4. Stir in dry ingredients until blended. Stir in chocolate chips just until combined. 5. Spoon into prepared muffin cups, dividing batter equally. Sprinkle some oats over the muffins. How happy would my kids be if I made them these. They look scrumptious! Would I eat these muffins because they are healthy? Not on your life! But because they look out-of-this-world delicious? You betcha I would. Just pour me a glass of cold milk and save me one or two. Chocolate chips, oats and bananas is a great combo! I've been looking for something like this! We'll see if they meet the picky-poo munchkin's standards. Thanks for posting. in the instructions it doesn't say when to add the brown and white sugars so i left them out by accident. Wow! These muffins are really amazing. They're so easy to make and they taste fantastic! I will definitely be adding this recipe to my cookbook! Thanks! I just made these. They are soooo good. Not too sweet, just enough chocolate. MUST TRY!